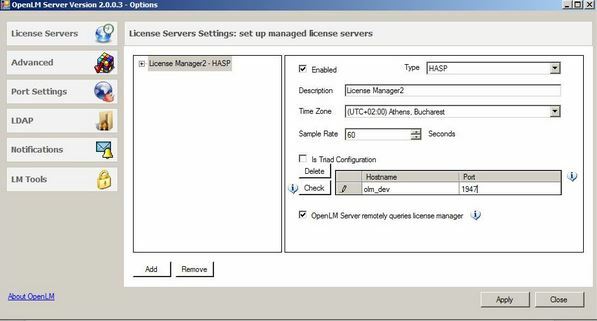 This application note elaborates the steps required to configure OpenLM to interface Sentinel HASP, to monitor license usage and obtain license statistics. OpenLM only supports HASP versions 5.0 and higher. Versions 4 and lower are not supported. From the Type drop-down menu, select HASP. OpenLM Server queries license manager check box: Keep checked (The OpenLM Server actively queries the license manager) . Click Apply, and then consecutively Restart now button. The Sentinel HASP server is now ready to interface with OpenLM. Open the Sentinel Hasp Admin Control Center port (default 1947) on firewall. In the Configuration tab, under the Basic Settings tab, change the settings of Sentinel Hasp Admin Control Center to check the box to Allow Remote Access to ACC . See the image below for clarification. Click EasyAdmin Start → Management → License servers. The “License Servers” window appears. Verify that the configured HASP license manager appear on the list. A green circle node indicates an active connection to a license server.